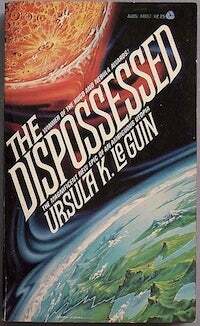 After a short break, "Blogging the Hugos" is back with 1975 Hugo winner The Dispossessed, by Ursula K. Le Guin. I thought it was right in so many ways — so what went wrong? For about three weeks now, I've been trying to figure out what to say about The Dispossessed. * I don't know that a book has ever driven me quite this crazy, because while I like a lot of things about it, I'm gradually coming to terms with the fact that I don't think I like it. It's kind of confounding. So let me start with the plot, and then we can move on from there. OK, so The Dispossessed (by the way, it also won the Nebula and Locus awards) is about two planets in the Tau Ceti system that orbit each other as they revolve around the star, so that they serve as each other's moon. One planet, Urras, is Earth-like — mostly covered in water and rich in life and material wealth. A couple of superpowers, A-Io and Thu, dominate the global political scene. The other, Anarres, is largely desert — habitable, but only with a lot of effort. Anarres was settled about 160 years before the start of the book by political dissidents from Urras, anarchist followers of the philosopher Odo. The Anarresti have had only the most minimal contact with Urras since they founded their new society: A few people on the two worlds communicate occasionally by radio, and eight times a year, a space freighter transports essential goods from Urras and takes back valuable minerals from Anarres in exchange. Among the collectivist Anarresti, who share all material goods, there's enormous resentment of the "propertarian" Urrasti, in part because of the unspoken truth that it's only thanks to the trade with Urras that life on Anarres can go on. Because of this hostility, no Anarresti has ever returned to the home world. That is changing as the novel opens. An Anarresti physicist named Shevek — perhaps the planet's most brilliant scientist, who has even won the equivalent of a Nobel Prize on Urras after one of his papers was sent there for publication — is boarding a freighter, in the hope of brokering some sort of better understanding between the two worlds. The first chapter describes Shevek's journey, and then the second flashes back to his early childhood; the rest of the book continues that way, alternating with each chapter between the story of his present on Urras and his past on Anarres. Now, not that I'm an expert in it, but I do like Taoism. The idea at its root, that apparently opposing forces are actually portions of a united whole — that seems to me to be a basic truth. So does the notion that each thing carries inside itself the seed of its opposite — there's nothing that is pure or perfect; everything has some black and some white to it. In keeping with that, Le Guin portrays both Urrasti and Anarresti society as flawed. As her fellow SF author Samuel R. Delany points out in this fascinating discussion with a group of university students from 1986, her subtitle for The Dispossessed, "An Ambiguous Utopia," seems to point to both the fact that either world might be considered a utopia by its inhabitants, and to the aspects of each that render it highly questionable whether either is a utopia at all. Urras — specifically, the capitalist A-Io, where most of the action takes place — is rich, but chauvinist and racist and plagued by war, its wealth built on the backs of its third-world people. Anarres is harsh in environment, but its lack of comfort leaves its people more free to grow emotionally and makes mass violence nearly impossible. What Shevek shows us is interesting on a certain level. For example, the workings of Anarresti culture aren't described in deep, deep detail, but clearly enough that you can see how it both allows for self-actualization and demands commitment to the success of the group as a whole. The political system Le Guin develops for Anarres isn't really any more feasible than those Heinlein proposed in either Starship Troopers or The Moon Is a Harsh Mistress, for basically the same reason as in those novels: She stacks the deck. As Delany notes in the discussion linked above, the jeopardous environment on Anarres and its small population are what make it possible for so many people to stick to Odonian principles. But Le Guin's intention was not to examine how an anarchic society might really come to be so much as to develop a viable one that could be fruitfully contrasted with a capitalist society like Urras or ours. That's where The Dispossessed turned me off, though. Despite making Anarres imperfect, with its sanctimonious leaders and insular policies, Le Guin still intends it to be morally superior to Urras. (This study guide for the novel puts it, "Sometimes the ‘flaws' she presents are so minor as to constitute merely a clever way of avoiding the criticism of perfectionism.") She intends the poor, beleaguered underclass of Urras to be morally superior to its sexist, frivolous upper class. And she intends Shevek to be morally superior to all of them — a fully realized self who learns to follow his heart when appropriate, but who can also sublimate his individual desires in the name of a greater good. And the thing is, I agree in large part with the underpinnings of her reasoning. For example, among other things, I would say there is a very broad but still genuine correlation between morality and a lack of focus on material wealth. And as I read, whenever Shevek quoted Odo or described life on Anarres, I said to myself, "Yes, that makes a lot more sense, fundamentally, than how we do things." But lack of nuance doesn't make for a bad book — it just makes for a book someone else might enjoy more than I did. The Dispossessed is very much worth reading. Still, I may not ever read it again. "Blogging the Hugos" appears every other weekend. In the next installment: The Forever War, by Joe Haldeman, from 1976. Josh Wimmer is a freelance writer in Madison, WI. He can usually be found here. *Thank you to everyone who wrote and asked where this column had gone. I was on vacation and had planned to file it as usual, but was having too nice a time relaxing. For future reference, I'll be posting updates and news about any interruptions at https://twitter.com/blogginghugos. You can also get the posts themselves in your RSS reader by subscribing to the feed at http://io9.com/tag/bloggingth…. **Although he didn't write it in response to The Dispossessed, as some sources claim, Samuel Delany subtitled his 1976 novel Triton "An Ambiguous Heterotopia" in "an attempt to put the two novels clearly into a dialogue [he] already felt was implied." That book also explores, in part, what a quasi-anarchist society might look like, and is worth a read. So is his "To Read The Dispossessed," which critique is several orders of magnitude more brilliant than anything I've written above; a sizable portion can be found on Google Books if you can't find the collection it appears in, The Jewel-Hinged Jaw.